This printable, re-usable shopping list is organized alphabetically within category. Print out and laminate the two sheets together back to back, or place them in a plastic page protector with a piece of heavy card stock in between the sheets. (This prevents it from creasing in your shopping bag and makes it stiff enough to write on and rub off.) 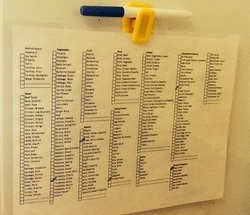 Hang on the refrigerator and check off needed items with a dry erase marker throughout the week. Scan the list again before heading to the store to jog your memory of additional items you need to purchase. At the store, simply rub off the check marks as you place items in your cart. Take home and re-use.